After a day exploring Roman Ruins and hiking Hadrian’s Wall, we still had a bit of a drive to get to our hotel for the night. Clennell Hall, near Morpeth was an hour away but with scenery this great it was no big deal. Having explored most parts of England I was so blown away by the beauty of Northumberland. Wide open spaces, empty roads, high moorland and best of all no mobile phone coverage. This is for sure a get away from it all kind of place. 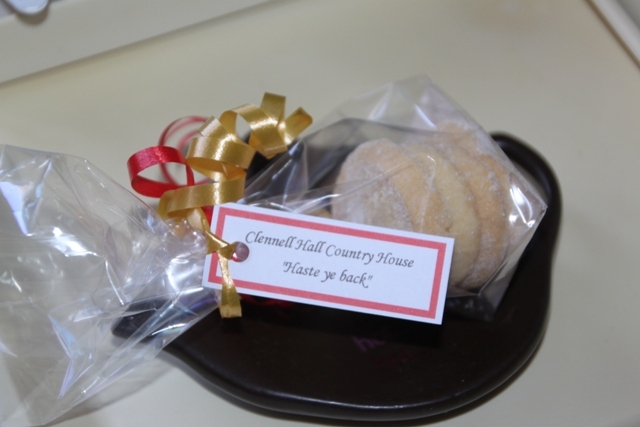 Husband found Clennell Hall on an internet search, it looked like a great deal so he snapped it up. It was a lovely old building in the most stunning rural setting – at the end of a track, fields all around with a stream running past. Never judge the book by the cover. In the opposite sense this time – this place looked wonderful, inside was a tad lacking shall we say. The building is beautiful, but its glory years are gone and it would need a fortune probably to bring it up to scratch. We were the only guests – does that say it all? 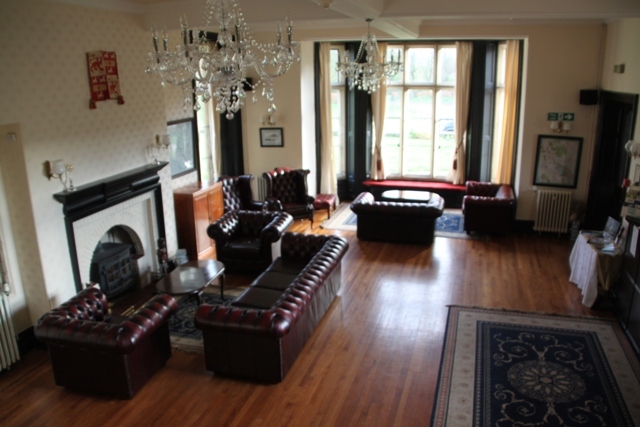 The reception area looked very grand – leather sofas, wooden floors and swanky chandeliers but you needed to put your coat on to go inside, the temperature plummeted once inside the door. Our room was not all bad. The good – it was huge, two windows looking out onto fields and sheep, very bright and very clean. The bad – the bed was seriously uncomfortable made worse when Son’s sofa bed collapsed as soon as he sat in it. 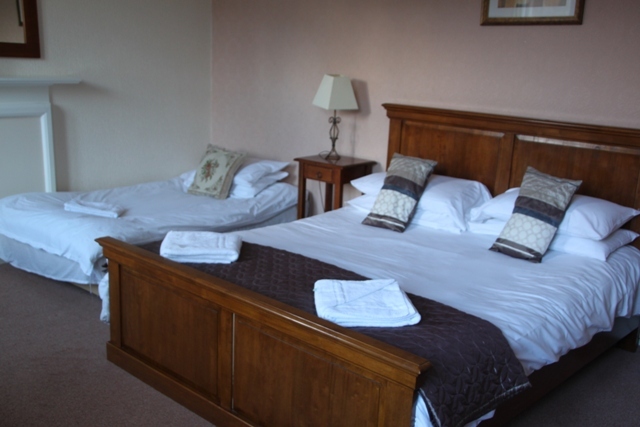 Result – we ended up three in a bed. Luckily it was wide so the little one didn’t need to shout roll over. A good night’s sleep was not had by all. 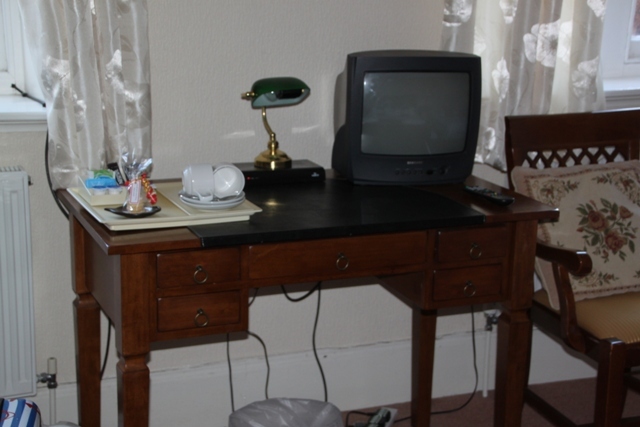 There was an ancient television (to be fair we never switched it on) and no WiFi or mobile phone coverage. The shortbread was a nice touch though – and very delicious. 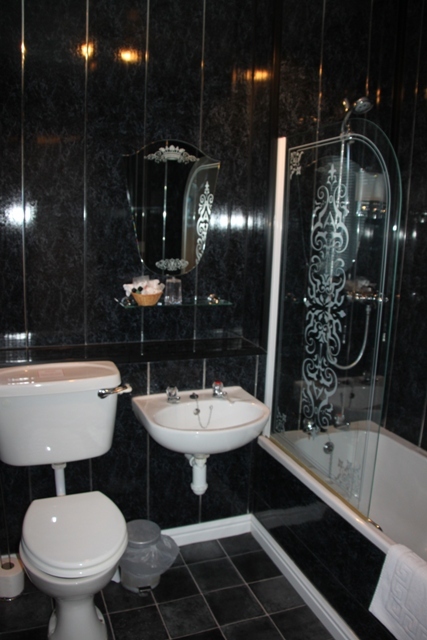 The bathroom had been revamped, but was a little garish and not in keeping with the lovely old hall. Still, it was clean and everything worked. 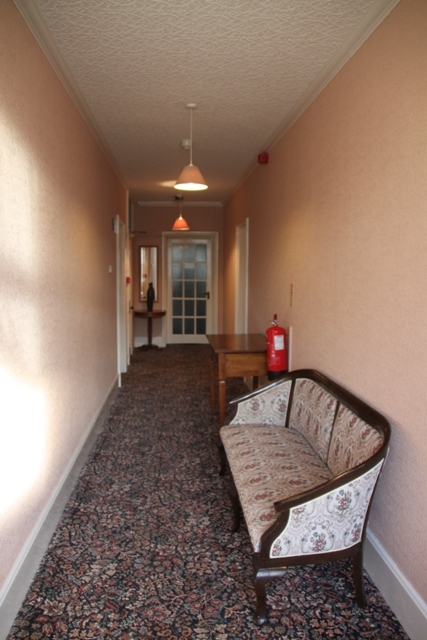 The rest of the hotel is caught in a bit of a 1960’s timewarp as we found when we explored some of the corridors. The gardens are lovely though and finally the rain had stopped. Dinner was served in the bar – you have to eat here, it is so remote there is no other option. Again we were the sole customers. The couple who own/run this place were charming, friendly and full of chat. Their painter/decorator was also very nice, he seemed to be moonlighting as the barman, a gift of a chocolate bar for Son meant a friend for life. To be fair Son loved it here. The owners had just taken charge of a 5 week old puppy a couple of days before – so for him it was a no-brainer. Cute puppy cancels out collapsing bed and Arctic temperatures, there was no competition. 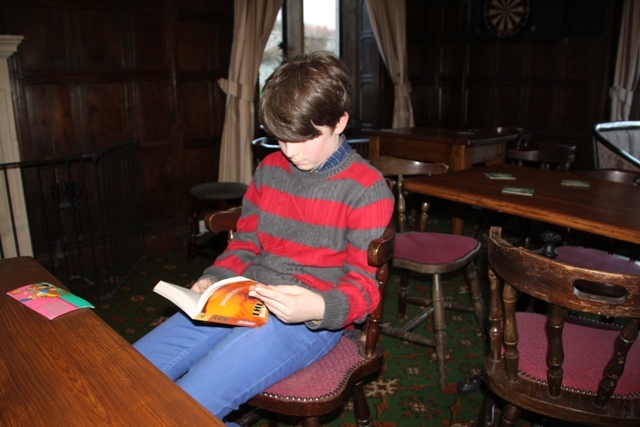 The food took about 1.5 hours to arrive (wouldn’t like to frequent this place on a busy night), but Son got to finish his book. Every cloud…..
Breakfast next morning was in another chilly room but was good. The whole downstairs though smelt strongly of cooking oil – like an overworked chip shop, not a good fragrance. We had originally planned 2 nights here, but had to change our plans. I wasn’t too sorry about that. 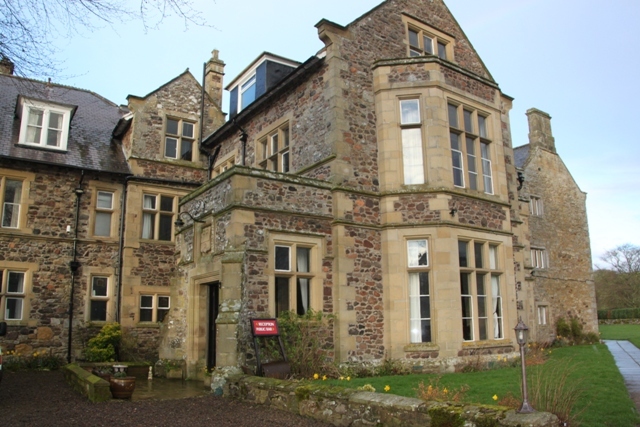 It is a gorgeous building in a lovely setting, the owners are charming and it is by no means the worst place I have ever stayed, just maybe not the best either…..
← Vindolanda – England’s Pompeii? What a charming place – great pictures! I want to go back to England. You should definitely try and visit Northumberland when you come back! Well you never what you are going to get in the “box of chocolates” do you? We have had the same experience on some of our travels! I am always surprised at what the places actually look like once I get there. I have them pictured differently in my mind even after lots of research on them! BUT, they do tend to remain in my thoughts the longest and I remember the “Off” places! And get a good laugh sometimes!!! So true about the “off” places, we stayed in a much nicer (but much blander) hotel after this one, I can hardly remember a thing about it, yet I remember everything about this one, and even a little fondly now too as we have laughed about the bad bits! I had the ‘Fawlty Towers’ theme music playing in my head as I read your blog article. I have stayed in some truly terrible places on my travels but somehow they end up among the most memorable and provide the best anecdotes. I know what you mean! This wasn’t by a long shot the worst place I’ve ever stayed – there have been some true horror stories down the years – but it was a bit haphazard. Still, like you say it was for sure memorable – I’m looking back a little fondly even now! We lived near Northumberland in Newcastle upon Tyne. Lots of great motels and pubs in England aren’t there? Thank you for stopping by my blog. Sorry if this comes across as rude, but I just started my blog, I was wondering how you came across it? Do you have a link to where you found it? Was it because I tagged it under it’s location? I’m wondering because my other wordpress blogs have not gotten any traffic so I am feeling slightly confused. 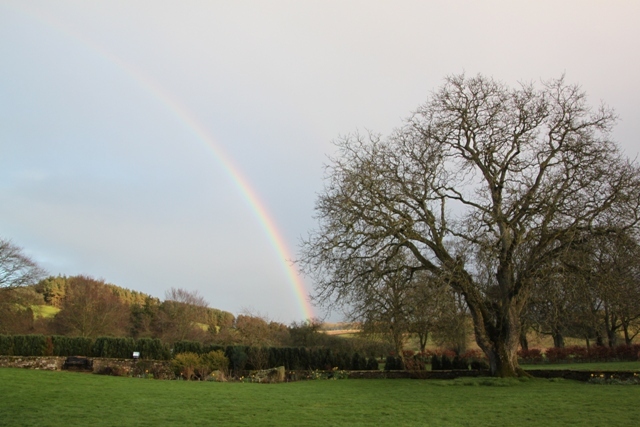 Northumberland is beautiful – we loved it! Came across your blog while looking under travel and Dubai in wordpress – your post came up there. It looks impressive but those huge old places must be a demon to heat, and being there on your own would’ve made for a funny atmosphere. Glad it wasn’t an entirely bad experience though. I can’t imagine you’ll be obeying the shortbread bag message any time soon! No that’s true Hayley, we won’t be hastening back!! I always judge a place by the quality of the bed. And by the peace and quiet. Sometimes this means that I ignore the pervasive smell of cabbage, but if I sleep well I’m happy. There was plenty of peace and quiet…. however the bed was so not comfortable! There were pros and cons, the setting is superb and the owners are really lovely. We didn’t get a good night’s sleep though and I know that can make all the difference!